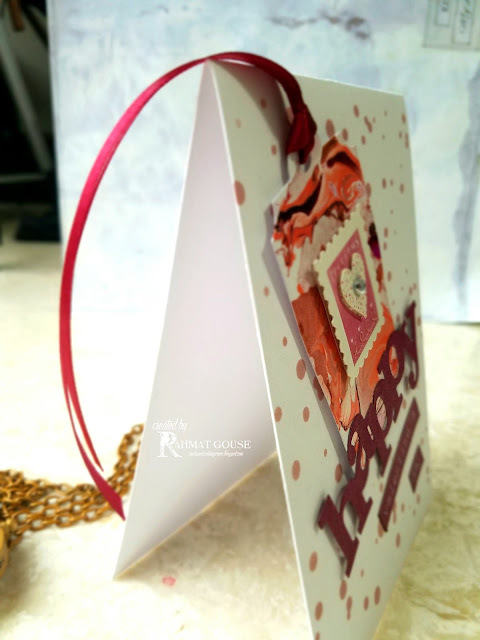 Hello blogger friends, its Thursday already, the week is going by pretty fast. 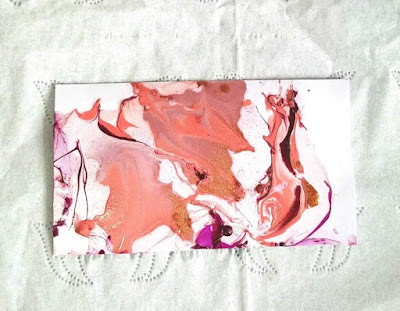 You might have seen that I am doing a lot of marbling. 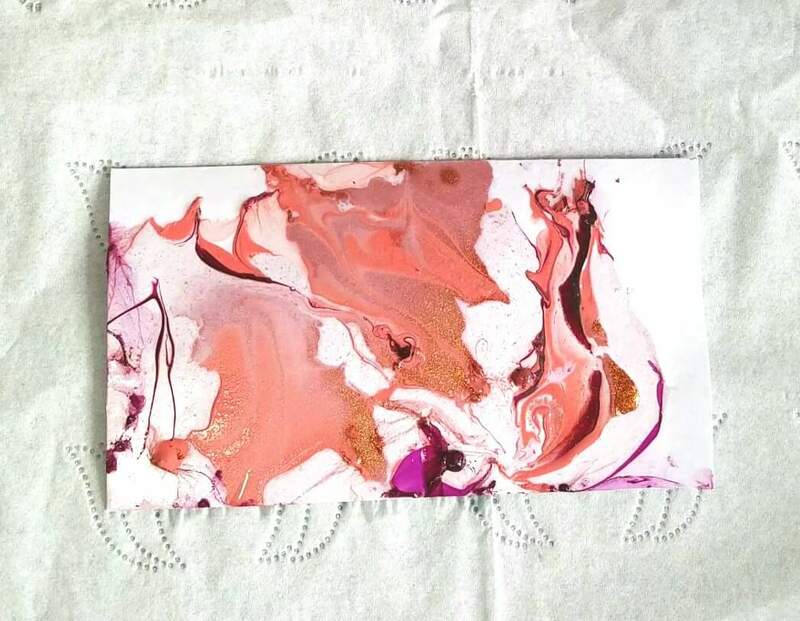 Today's card has Nail marbling on it, it is the same panel I shared on Instagram a few days back. I LOVE nail marble art, and I was completed hooked into it. But today it just a card. I started with the same technique as for the nails, and instead of dipping the nails, I dipped the white card stock panel, and lifted it up, and TADAA I had this beautiful panel. Now I had waited more than a day to think it through, to how to use the panel. 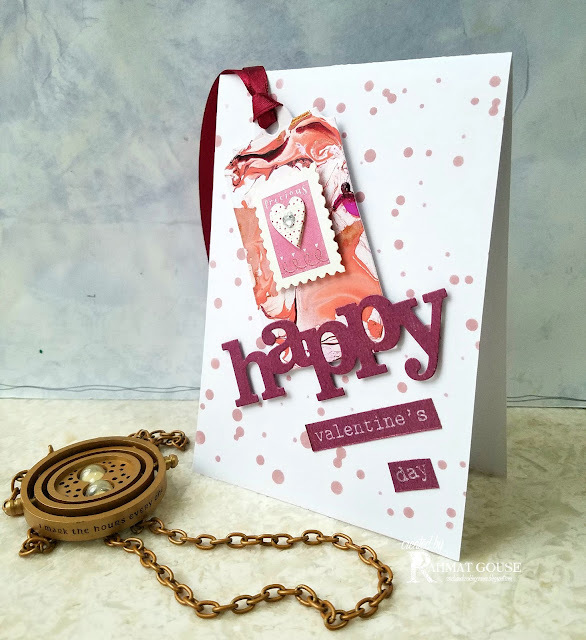 It's not the size that I could use as a whole base, so I ended up using it as a tag, I used Avery Elle Tag die to cut out a tag. I added a heart stamp sticker from my collection, the colors go pretty well with the tag. I decided to add a matching satin ribbon to tie the tag, and I LOVE LOVE the way the ribbon hangs! The base was looking too plain, so I used the stencil from winnie&walter to ink it in velvet rose distress ink. The happy is also from winnie&walter, and cut out using a maroon shimmery card stock. I decided to stamp the sentiment on the same card stock, also from w&w. 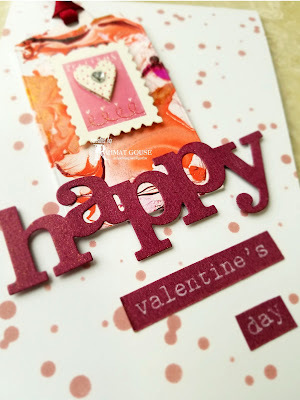 That is it, all done, and I can say that I am in LOVE this card, specially the colors!!! 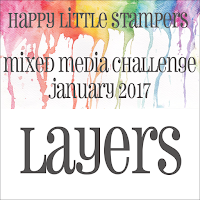 I have too many mixed elements and I am hoping the layering on the tag counts! 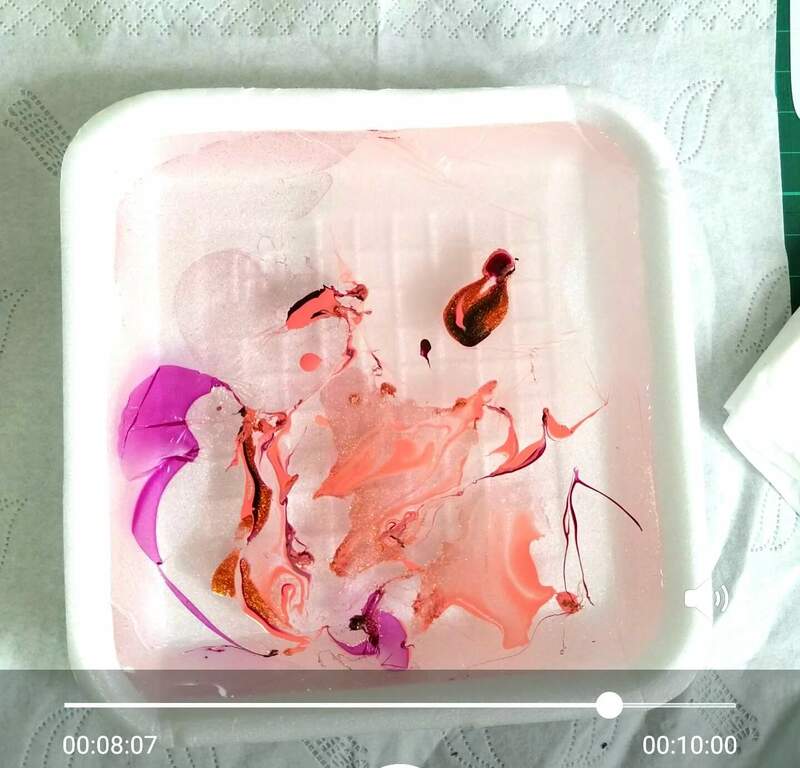 Another entry here, and I am hoping the nail polish counts as liquid colors! Oh, it is crazy beautiful! I love what you've finally created - everything fits perfectly!!! WOW this is just awesome! 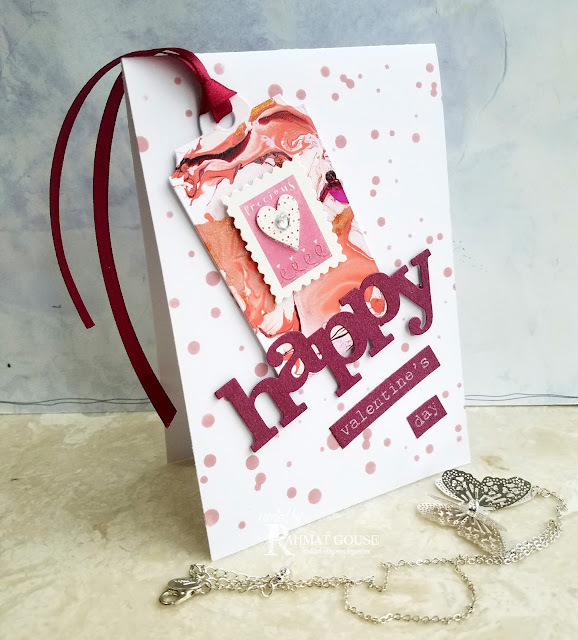 Love that technique and your over all design is fabulous! GREAT JOB! 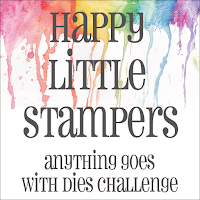 Thanks so much for playing in our ‘Anything Goes with Dies’ challenge at Dies R Us! Please come back again soon! What pretty colors and I love that little heart and the polka dot background, Rahmat! Thanks so much for sharing again with us at CAS Mix Up! 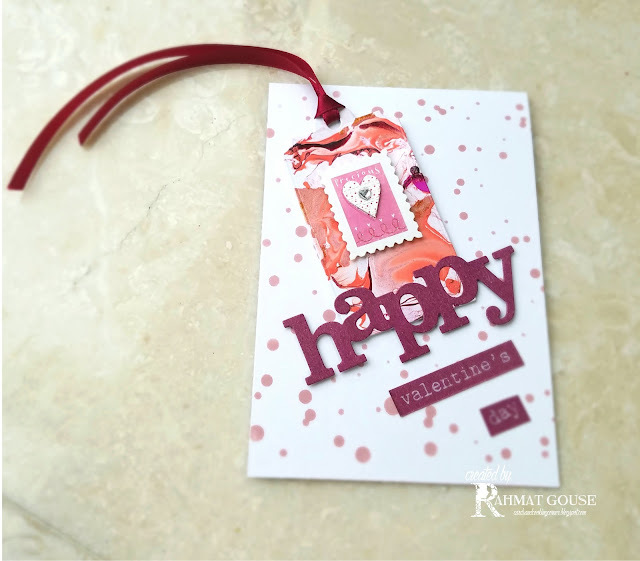 Your gorgeous marbled tag turned into and even more beautiful card, Rahmat. I love all your elements and beautiful color combo for your CAS design. TFS and joining us at CAS Mix Up. 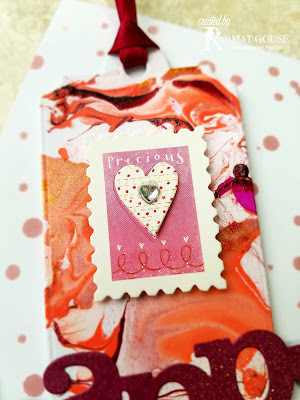 Hugs..
Gorgeous gorgeous marbling - the colours work so well together! Thanks for spreading The Gossip on w&w's The Gossip Column!